How do you select the best dehumidifier when there are so many choices out there? An expert at Global Heating & Cooling can help you choose the best fit for your home. We will consider factors unique to your situation - such as the size of the area to be dehumidified, natural humidity in your area, sources of moisture in your home, and overall dampness that needs to be addressed. A dehumidifier is a device that is used to remove moisture from the air. Most dehumidifiers automatically shut off when they are full and need to be emptied on a regular basis for most efficient use. However, some models are able to have the moisture directed to an appropriate area outside or into a sink or drain using a hose. Dehumidifiers are generally placed in an area where air can freely circulate around the dehumidifier. While the unit is running, windows and doors to the area being dehumidified should be closed for best results. It is important that the area is relatively clean, as excess dust and dirt can inadvertently clog the coils in the dehumidifier. All dehumidifiers work a bit differently, so it is important to read and follow the manufacturer's instructions for your specific model. Global Heating & Cooling will be able to help you figure out what type of dehumidifier you need. Most dehumidifiers specify their capacity in a number reflecting pints of water obtained per twenty-four hours. For instance, a dehumidifier with a rating of 10 would capture 10 pints of moisture per 24 hours, whereas a dehumidifier with a rating of 44 would capture 44 pints of moisture per 24 hours. 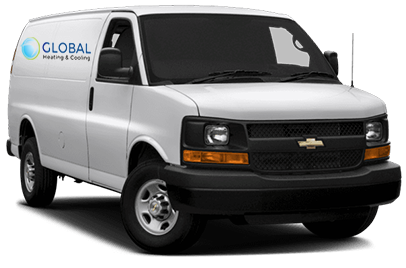 Our team of experts at Global Heating & Cooling can be reached at (773) 801-3734 We are currently offering to wave our standard trip charge for any clients who purchase services totaling more than $150.